It is replaced by the Intermec PC43t. The Intermec EasyCoder PC41 printer facilitates label printing in almost any environment including retail, office, health care, logistics, government, manufacturing, and warehouse, particularly where space is limited. 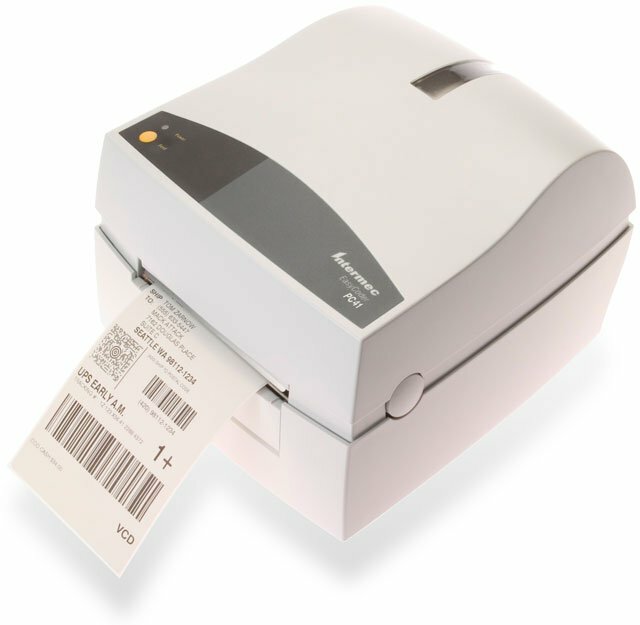 The EasyCoder PC41 is a small, compact desktop printer that prints labels, tickets, and tags up to 4.1 inches wide to meet compliance mandates. Connect & Print features of the EasyCoder PC41 printer ensure quick and easy setup and printing. The EasyCoder PC41 printer comes standard with software, drivers, cables, labels, and QuickStart Guide to facilitate getting started. RS-232 and parallel interfaces are standard (Ethernet, IBM Twinax and Coax interfaces are optional). The EasyCoder PC41 is compatible with EasyCoder 7421 installations and features a 203 dpi resolution. Includes Intermec LabelShop START barcode label design software. 4" x 6" Thermal transfer paper label. Fanfolded. 6000 label/case. 2.25" x 1".25" Direct thermal paper label. 1,200 labels/roll, 8 roll case. 4" x 6".5" Thermal transfer paper label. Fanfolded. 6,000 labels/case. 4" x 2.5" Direct thermal paper label. 1,158 labels/roll, 1" core. 8 roll case. 4" x 1" Direct thermal paper label. 1,600 labels/roll, 8 roll case. 2.5" x 299' Black Wax-Resin Ribbon. Compatible with Desktop Printers. Single ribbon. Used with polypropylene labels. 1.299" x 500' Black Resin Ribbon. Compatible with Industrial Printers. Single ribbon. Used with polyester labels.